As The Pop World Seeks Accountability, Justin Timberlake Seems Lost In The Woods NPR Music's Ann Powers breaks down the mixed reaction to Timberlake's big week, in which a new album and a Super Bowl performance both took a beating in popular opinion and the press. Justin Timberlake performs during the Super Bowl LII halftime show on Feb. 4, 2018. Justin Timberlake has had an eventful week: He turned 37 on Wednesday, dropped a new album Friday and danced his shoes off Sunday as part of football's biggest night. The reception to the latter two has been mixed: Man of the Woods is shaping up to be his worst-reviewed solo work by a mile, and his Super Bowl performance unfolded in the long shadow of his 2004 performance with Janet Jackson, when half a second of exposed flesh sparked a major TV controversy and arguably derailed Jackson's career. 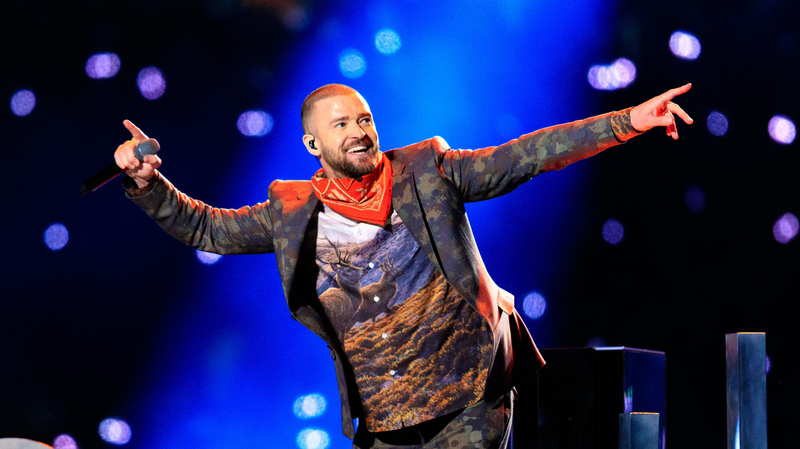 Ari Shapiro spoke with NPR Music critic Ann Powers about why Timberlake, who once rocketed out of the teenybopper world to become a standard bearer of futuristic pop, now seems so out of step with his moment. Hear the radio version at the audio link and read more of their conversation below. Ari Shapiro: This is not the first time Justin Timberlake has done the Super Bowl halftime show — of course, his 2004 performance with Janet Jackson was overshadowed by that notorious wardrobe malfunction. No glaring errors this year; what did you think of the performance? Ann Powers: Well, on the surface it was a success: He played many of his hits, he danced, he sang. He even invoked Prince, the patron saint of Minneapolis, when he sang along with him while Prince's image was projected on a giant, billowing sheet. But the entire performance was shrouded in the sense of Timberlake not being right for this moment — and the Janet Jackson controversy haunted it. He chose to perform the song "Rock Your Body," during which the famous wardrobe malfunction took place, and yet he didn't mention Janet: He didn't shout her out, and he stopped the song right before the line during which he ripped off her costume. It was almost like he was trying to erase what had happened in the past, but that is just not flying in 2018. You say "not right for this moment." Explain what you mean by that. Justin Timberlake's entire career and art is based on his ability to be smooth — his ability to be easy, to create music that seduces us with references to the past, with appropriations, with artful mixes, and never quite shows any struggle. But we are living in a moment of struggle, and we want our pop music to also reflect that struggle. And frankly, Timberlake now embodies that phrase so often spoken today: white male privilege. It's just not a good look for 2018. And it's really, in some ways, not his fault — it's just who he is. A lot of artists recently have used the Super Bowl halftime show as a showcase for new music: Beyoncé did it, Lady Gaga did it. Justin Timberlake dropped a new album on Friday, and performed very little from it in his halftime show. His new album, Man of the Woods, is almost like three records in one: It's very ambitious, but most critics are saying an ambitious mess. It feels like he couldn't make a choice, and maybe that's why he didn't cull from the material, because there's no clear hit or leading element on it. There is what I think is a buried masterpiece — maybe masterpiece is strong — but Justin Timberlake could have made a great country album. It's kind of on there; he collaborates with Chris Stapleton, the current country leading man, and there are several songs that sound so much like the best of mainstream country. But he refused that role, and I think that was a huge mistake on his part. So it has been an eventful week for him, but maybe not a totally triumphant one. It's gotta be confusing for a guy like Justin Timberlake, who is used to making hugely successful and fairly sophisticated pop music, but 2018 is a different time. Right now, the feminist reckoning that's taking down popular figures is also making us think about art itself differently. That's how Man of the Woods is being judged. No longer can a star like Justin Timberlake — a white artist who has spent his career connecting with black music and popular culture, a straight male artist who has released countless dance-floor seductions that sometimes veer into pushiness, let's say — expect for people to just accept this point of view. I'm not trying to sound like a radical feminist, I'm just saying that's the tenor of our times. It's got to be super confusing to Timberlake, but it is what it is; this is where we live. We want statements and struggle in our pop music, not just another smooth dance mix.